This African Peanut Stew is a delicious winter comfort! It impressed all of the staff here at our Meatless Monday Staff Lunch! In a large pot over medium heat, warm the olive oil. Add the onion, sprinkle with salt and cook for 3 minutes, until translucent. Add the garlic, jalapeño, ginger, cumin and cayenne then stir together and cook for about 2 minutes. Add the tomato paste and stir together. Add the red pepper, sweet potato, peanut butter, vegetable broth and water. Stir together and bring to a boil. Reduce heat to medium-low, cover and cook for 15 minutes. Add the chopped collard greens to the pot, stir, then cover and continue to cook for another 15 minutes, until sweet potato is tender. Using the back of the spoon, mash some of the sweet potato to help thicken the broth. Boil uncovered for 5 minutes. 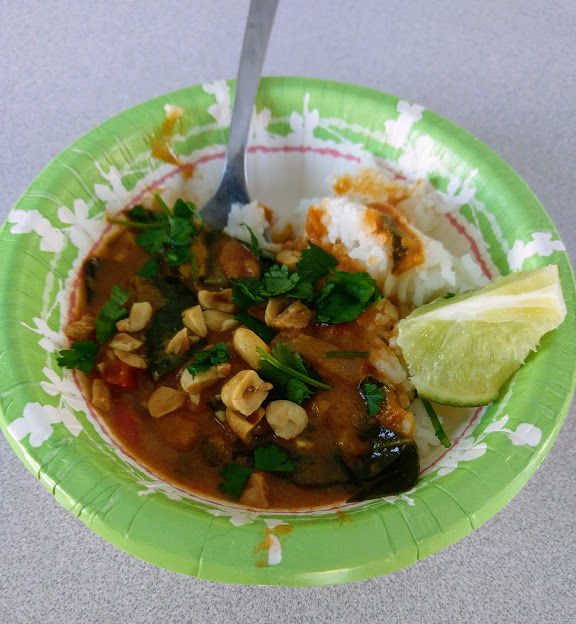 Serve warm with rice and garnish with cilantro, peanuts, lime juice, and hot sauce. This week, it was our Ecolibrium3 staff member Shannon's turn to make the staff lunch and she added her own notes and description below! "Eco3 member Zach and I had been talking for some time about how much we liked African Peanut Stew. There was a lot of curiosity in the office about the recipe, so I thought I’d try to find one without the chicken base my usual go-to recipe has. I found a recipe at makingthymeforhealth.com and what follows is that recipe with just a few changes. It is a good, basic recipe easily adapted to whatever types of vegetables you like or have on hand like substituting carrots for sweet potatoes or kale for the collards. Even with the inclusion of the jalapeno pepper, this is a mildly spiced recipe. If I had made this for myself, I would have increased the heat by adding more jalapeno, garlic, and ginger. Alternately, serving this with your hot sauce of choice on the side (Sriracha, anyone?) can help satisfy the spice lovers while keeping those with more delicate palates comfortable. Because I’m a foodie, I’d be remiss if I didn’t include some general cooking info about some of the recipe ingredients to help you with your future kitchen adventures. For those not in the know, most of the heat in a jalapeno is found in the ribs near the top of the pepper, with some heat in the seeds as well. So, if you want to keep it cool, cut out the ribs and seeds as I did for the communal lunch. Adding salt while you are cooking dilutes the salt taste, but not the sodium content, so it is always a good idea to keep salt at a minimum during preparation as it can always be added later at the table. With that said, one of the very first instructions in the recipe is to use salt when sautéing the onions. This is to help them release moisture, so do use it. Don’t worry – it doesn’t take much. If you are watching your salt intake, you can also use reduced sodium broth. If you up the spices, you can increase flavor at the same time you are reducing the sodium. One last thing; this recipe freezes and reheats well, so double the batch, freeze some, and you’ll have a quick go-to meal later on with very little effort. I hope you enjoy this as much as we did.